Wash the rice in several changes of water until water runs clear. Place rice in a large bowl and pour in enough water to reach 5cm above the rice. Allow to soak for 2-3 hours. Drain. Prepare steamer and steam rice for 20-25 minutes, or until half-cooked. Take rice off the steamer and stir in the thin coconut milk, followed by the halba, ginger, shallots and garlic. Set aside, covered, for 2-3 hours. Reheat steamer. Mix thick coconut milk with the sugar and salt, and stir this through the rice. Steam until rice is well cooked. Serve warm with Gulai Ikan Tongkol, Fish Sambal and Spicy Eggs. 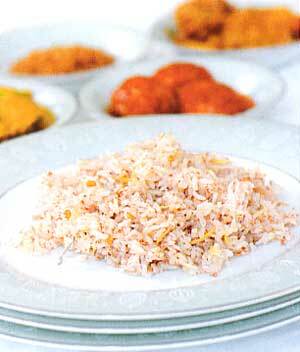 For perfectly cooked nasi dagang, use equal amounts of liquid (in this case, coconut milk) and rice. For more food and wine stories and recipes, pick up the latest issue of Flavours (May - June 2004), Malaysia's premier food magazine, available at major bookstores and newsstands or email cir.ccu@thestar.com.my for subscription details.